LOS ANGELES -- Credit the Arizona Coyotes' four-game winning streak to rookie goaltender Adin Hill. Or maybe newly acquired center Nick Schmaltz. "He's unflappable right now," Arizona coach Rick Tocchet said. "He's feeling it and it's a nice story." Tocchet said he hasn't decided whether to stick with Hill going forward. Raanta and Darcy Kuemper are close to returning from lower-body injuries. "Honestly, for me, we're just taking it a day at a time," Tocchet said. "You have to right now. He's done a great job for us since that Minnesota game on. He's come in and he's put the plug in for us. We have some guys hurt and he's holding the fort." The Coyotes also lead the NHL by killing 90 percent of penalties this season. They have allowed a league-low eight power-play goals. "Obviously, we're trying to stop the puck going into our own net and when you can chip in offensively, it's a bonus," said Crouse, who has two short-handed goals. "I think we're just playing to our systems, playing fast and jumping at the right times and getting chances and obviously bearing down at the right times." "We've got to play a lot more minutes like we did the last five to seven minutes," Kings center Anze Kopitar said. "You could tell there was desperation there. You've just got to play like that for 60 minutes." Kings forward Trevor Lewis (foot) had surgery and will be out four to five weeks. Lewis has missed 11 games since getting injured in practice on Nov. 16. ... Tocchet did not have an update on forward Michael Grabner, who injured his eye Saturday against St. Louis. ... The Kings activated forward Nikita Scherbak (lower body) off injured reserve. The team claimed Scherbak, a first-round draft pick by Montreal in 2014, off waivers on Sunday. 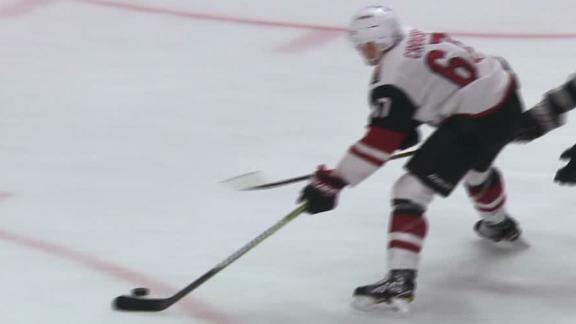 Lawson Crouse opens scoring in the first period and Nick Schmaltz tacks on a goal in the second to power the Coyotes to a 2-1 win over the Kings.